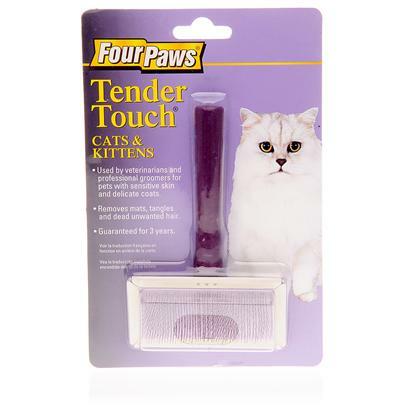 The Four Paws Tender Touch Brush is designed for cats with sensitive skin and/or delicate coats. It removes dead and loose hair and tangles and mats which reduces shedding, helps prevent hairballs, and keeps your cat's coat healthy and shiny. The stainless steel wire bristles also massage your cat's skin, making grooming a soothing experience. Just remember, this is a gentle brush, so avoid vigorous brushing. The brush has a soft reinforced rubber pad and a polished wooden handle. Veterinarians and professional groomers love it, because the brush is easy to use and works on all breeds of cats. It's also guaranteed for three years. Place your hand on your cat's coat so that you don't tug the skin as you work the brush over the coat. Work slowly and in small sections. Be careful not to scrape your cat's skin or brush too vigorously. Continue brushing your cat until you've worked through the entire coat.